Sumakshi Singh likes to create fairytale-like artworks and installations. Her art works are very colourful and give an impression as if they have grown out of the floors or walls! For example, for her work – Crack done in 2004, she layered paint on the gallery wall to impersonate cracks of the wall. Her painting and installations are always very interactive. Her latest exhibition, Leaving The Terrestrial: Its Own Kind Of Archive, was inaugurated on May 7 at The Bhau Daji Lad Museum in Mumbai and will go on till June 6, 2017. This show addresses leaving the terrestrial in many ways. Sumakshi has created marine and botanical forms using wires and delicate threads referencing nature, fantasy, science, art and craft. She has shown giant suspended corals of metal and thread, seaweed, jellyfish, pressed flowers, leaves, and seeds skeletons of algae. Her second installation is a stop motion animation on transparent hanging scrolls of fabric, which represents radiant and dazzling garden of evolving life forms. A young Indian artist and an educator, Sumakshi Singh did her B.F.A from Maharaja Sayajirao University in Baroda (MSU), and completed her M.F.A degree from School of Art Institute of Chicago, she also taught there for five years and lectured at Oxford University, Columbia University, and Chicago Humanities Festival. Singh completed her residency at Skowhegan School of Painting and Sculpture in Maine. Singh has exhibited solo as well as in curated group shows in galleries and museums, in India as well as China, U.S.A, Canada, Italy, France and Switzerland. 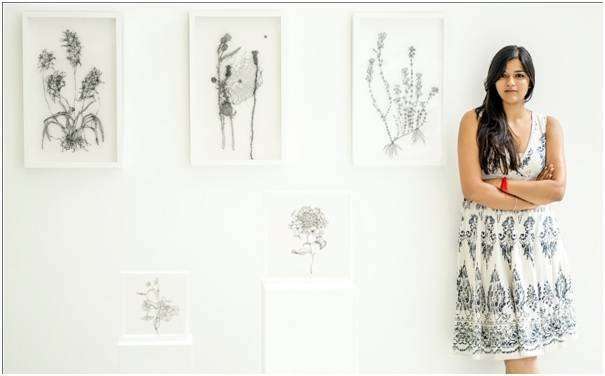 The artist has also showcased her work in Kochi Biennale. She has exhibited extensively in many museums and galleries in different countries which includes the MAXXI Museum-Rome, Matters Factory Museum of Contemporary Art, Pittsburgh, UCCA-Beijing, Van Harrison gallery New York Illinois State Museum-IL, SC and ArtHouse-Texas, Museum of Contemporary art Chicago, IL. She was one of the finalists for Rolex mentor protégé and was awarded Rijksakademie. Over all, this entire exhibition will give you feeling of being a part of a fairytale inside the ocean. Do visit it to enjoy the feeling.